Meigs sophomore Kylee Mitch (7) settles under the ball, during the Lady Marauders’ straight games victory over River Valley on Thursday in Bidwell, Ohio. BIDWELL, Ohio — What goes around, comes around. 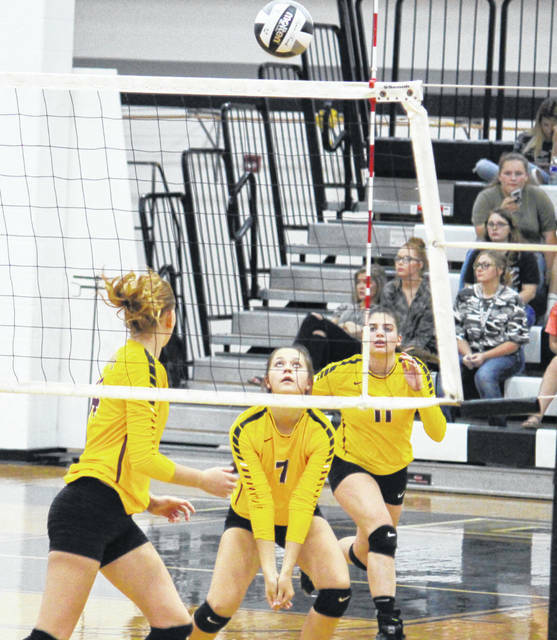 The Meigs volleyball team — which dropped a five-game decision to River Valley on Aug. 28 — avenged that setback in Tri-Valley Conference Ohio Division action on Thursday in Gallia County, defeating the Lady Raiders in straight games. River Valley (7-7, 2-5 TVC Ohio) and Meigs (4-10, 1-5) battled through six lead changes in the opening game, with the Lady Marauders taking the lead for good at 21-20, as part of a 7-0 run. MHS won the opening game by a 25-20 count, and carried the momentum into the second, never trailing en route to a 25-16 win. Meigs scored the first eight points of the third game and sealed its first victory in five matches with a 25-9 win. 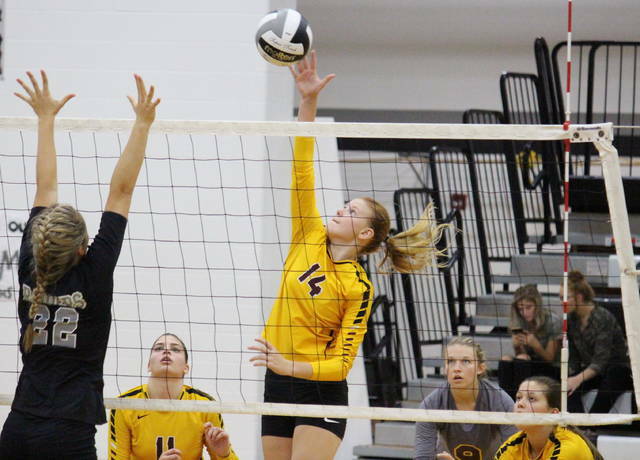 In the match, the Lady Marauders had a side-out percentage of 57.4, while RVHS had a 35.1 side-out percentage. Madison Fields led Meigs with 17 service points, followed by Mallory Hawley with 10. Maci Hood finished with eight points, Breanna Zirkle added seven, while Bayee Tracy had four and Marissa Noble earned two points. River Valley’s service was led by Mikenzi Pope and Taylor Huck with five points apiece, to go with three and two aces respectively. 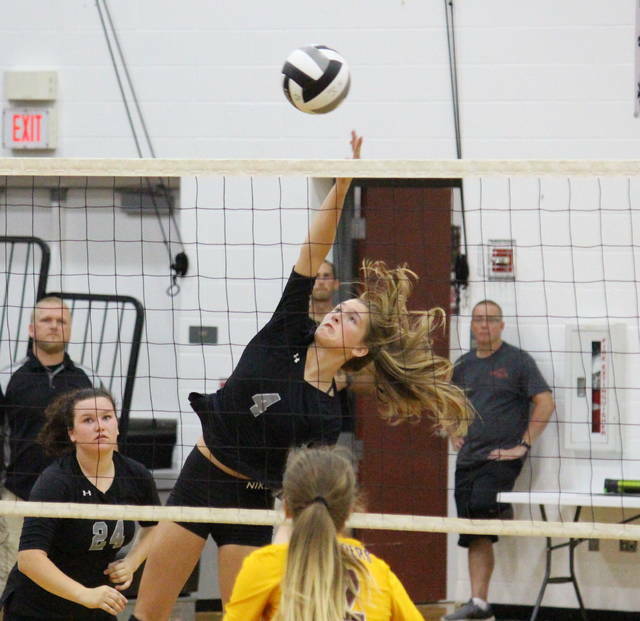 Alexandria Wood and Breanna Dodrill each had three points, while Kelsey Brown and Kasey Birchfield each had two points, with Wood and Brown each earning an ace. 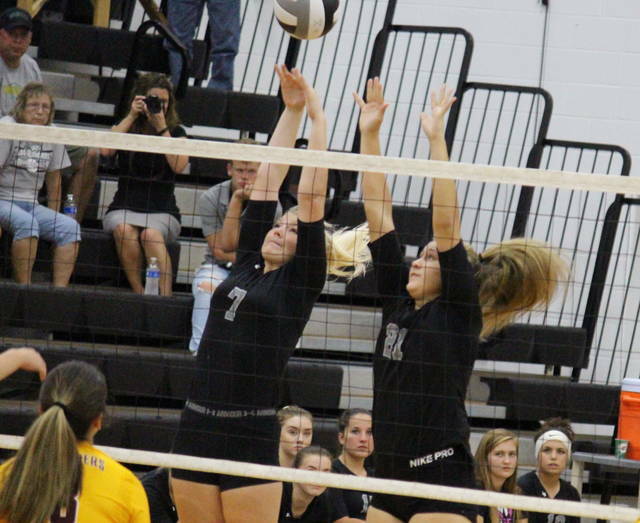 Brown and Pope each had three kills to lead RVHS, with Brown earning an block. Rachel Horner had two kills in the setback, Birchfield picked up a kill and a block, while Wood earned a kill and a team-best five assists. Hannah Jacks and Cierra Roberts each came up with a kill for the Silver and Black. Meigs will have a non-conference match at Marietta on Monday, while River Valley returns to action at Wellston on Tuesday. Addition Meigs statistics were unavailable at presstime.